The wide, flat muscle that separates the chest and abdominal cavities is called the diaphragm. The diaphragm forms when a fetus is at 8 weeks’ gestation. When it does not form completely, a defect, called a congenital diaphragmatic hernia (CDH), is created. This is a hole in the muscle between the chest and the abdomen. The majority of CDHs occur on the left side. The hole allows the contents of the abdomen (stomach, intestine, liver, spleen, and kidneys) to go up into the fetal chest. The herniation of these abdominal organs into the chest occupies that space and prevents the lungs from growing to normal size. The growth of both lungs can be affected. The result of this is called pulmonary hypoplasia. While in the uterus, a fetus does not need its lungs to breathe, because the placenta performs this function. However, if the lungs are too small after the baby is born, the baby will not be able to provide itself with enough oxygen to survive. What is the outcome for a fetus with CDH? There is a wide range of severity and outcomes for CDH. In the best cases, some infants do very well with treatment after birth, surgery and care in an intensive care nursery. In the most severe cases, some will not survive no matter how hard we try. And in the middle, some will live normally while others will have a difficult time and may have some handicaps ranging from mild learning problems to breathing and growth problems. How the baby does after birth is determined by how well the lung grows before birth and its function. Fetuses on the best end of the spectrum have an excellent chance to lead a perfectly normal life. They do not require special prenatal management in terms of the timing or type of delivery, but should be delivered in a perinatal center with a Level III intensive care nursery with neonatal and pediatric surgery support. The place of delivery is very important because transporting these babies after birth can be dangerous for the infant. Babies still need to have the diaphragm hole repaired after birth and will be in the intensive care nursery for several weeks. Even though the lung isn’t of normal size at birth, it has the capacity to grow and adapt for many years, so these children can lead normal active lives without restriction. On the other end of the spectrum, babies with severe CDH and very small lungs can have difficult challenges after birth, and some will not survive. These babies require very skilled intensive care to stay alive—things like high-frequency or oscillatory ventilation, inhaled nitric oxide and, in some cases, extracorporeal membrane oxygenation (ECMO). ECMO provides temporary support for lung failure by circulating the baby’s blood through a heart-lung type machine. It can be life-saving, but can be used for only limited time. Babies with CDH should be delivered in an experienced tertiary perinatal center with ECMO capability. The surgery to repair diaphragmatic hernia after birth is not an emergency and is usually performed when the baby has stabilized, usually within the first week of life. After repair, these babies will need intensive support for many weeks or even months. Even when the CDH is severe, greater than 70% of affected babies can be saved with intensive support. However, there can be long term health issues related to breathing, feeding, growth and development. How serious is my fetus’s diaphragmatic hernia? Amniocentesis and/or microarray may be advised for chromosome testing. Sonography is the best imaging tool, but is dependent on the experience and expertise of the physician. Magnetic resonance imaging (MRI) may be used in some cases. Many problems are first detected during routine screening procedures performed in your doctor’s office (amniocentesis, maternal serum screening, routine sonography). However a through assessment usually requires a specialized perinatal/neonatal center with experience managing complex and rare fetal problems. We can work with your doctor to find a center convenient for you. Careful and accurate prenatal assessment [level II sonogram, echocardiogram, sometimes magnetic resonance imaging (MRI)] may help us predict before birth the severity of the CDH. One of the most important issues is to make sure there are no other birth defects (like heart problems) that can affect outcome and treatment options. When CDH is the only problem, we have learned that severity and, thus, outcome is determined by two factors: 1) liver position, and 2) lung-to-head ratio or LHR. Liver position refers to whether or not any portion of the liver has herniated, or gone up into the chest of the fetus. Fetuses with the liver up in the chest have a more severe form of CDH and a lower survival rate. The majority of the CDH patients we evaluate have some portion of the liver herniated into the chest. The lung-to-head ratio, or LHR, is a numeric estimate of the size of the fetal lungs, based on measurement of the amount of visible lung. High LHR values greater than 1.0 are associated with better outcomes. Fetuses who do not have liver herniated into the chest (liver down) usually have a less severe form of CDH and therefore a better prognosis. In our experience evaluating many hundreds of CDH patients, these patients do well after birth. We are, of course, delighted when we can predict a good outcome. These babies will still need specialized care after birth. We recommend these babies be delivered normally near term in a center with an intensive care nursery, pediatric surgery, and ECMO capability. Fetuses with liver herniated into the chest and a lung-head ratio less than 1.0 have a more severe form of CDH. We can predict that they will have a very difficult time after birth. Most can be helped with very high level intensive care, and may need ECMO. However, the very intensive care required for the most severe cases can lead to complications and long-term problems, including breathing and feeding difficulties. Although you can be given a prognosis on the severity of the CDH, until the baby for sure is born, there isn't a test to perform during pregnancy that can predict lung function. How your baby's lung's function will only be determined after they are born. For those families who choose to continue the pregnancy the most important next step is the accurate prenatal diagnosis about the severity of the condition which determines the choices available for prenatal management. If your fetus is on the better end of the spectrum, the most important choice is where to deliver the baby. The timing and type of delivery will not greatly affect outcome, but the place of delivery certainly will. Families will want to work out a plan for delivery and postnatal care with their obstetrician/perinatologist, the neonatologist, and pediatric surgeons so the baby can be stabilized and treated in the same center. For fetuses in the middle of the spectrum, the place of delivery becomes even more important. These babies will need very intensive support after birth and should be delivered in highly experienced centers with ECMO capability. ECMO is a heart-lung machine that provides oxygen to the baby when the lungs are not capable of doing this. It is a medical therapy that can be used for a limited time, usually up to two weeks. Careful planning and coordination of the timing of delivery is necessary to avoid high-risk situations such as delivering in one hospital and then needing to transport a critically ill baby to a specialized center. Fetuses on the most severe end of the spectrum with liver up and LHR less than 1.0 may be candidates for prenatal intervention. For more than two decades, we have been working on ways to improve the outcome for these fetuses by getting the lung to grow before birth, so that it will be adequate at the time of birth. The most promising uses FETENDO fetal surgery, specifically a fetoscopic temporary tracheal occlusion to enlarge the fetal lung. While in the uterus, the fetal lung constantly makes fluid that escapes through its mouth and into the amniotic fluid. When the trachea is blocked, this fluid stays in the lungs. As it builds up, the lung fluid expands the lungs, stimulates their growth, and pushes the abdominal contents (liver, intestine) out of the chest and into the abdomen. The goal of this treatment is to have a baby born with lungs that are big enough to provide adequate oxygen to the infant. The FTC at UCSF has long been the world leader in treatment for CDH. We have received approval (an investigational device exemption) to use a new medical device for tracheal occlusion in severe CDH. We have the only significant experience with tracheal occlusion in the United States, having performed a prospective randomized trial in the past sponsored by the NIH and published in the New England Journal of Medicine. Although we did not find a difference between the tracheal occlusion group and the control group, we learned much from the trial. We offer tracheal occlusion to a select group of patients that we feel have the most to potentially benefit from this procedure. Using only a tiny keyhole incision in the mother and mother's uterus, and a tiny detachable balloon is placed in the fetal trachea. Once the fetal lung has grown, the balloon can be removed or deflated so the baby can be born normally. Both insertion and removal of the tracheal ballon happens before birth; as a result, mothers can deliver vaginally without need for an EXIT procedure in most cases. We feel that this more minimally invasive strategy will allow mothers to stay pregnant longer and avoid the complications of preterm labor associated with previous attempts at tracheal occlusion. Who is a candidate for balloon tracheal occlusion? 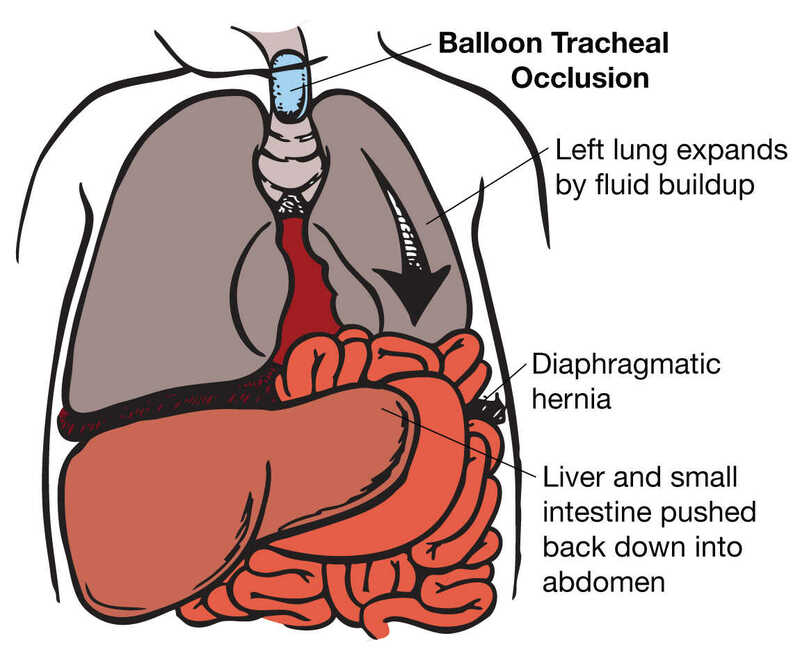 Balloon tracheal occlusion is only offered to those patients whose fetus have the most severe form of congenital diaphragmatic hernia. 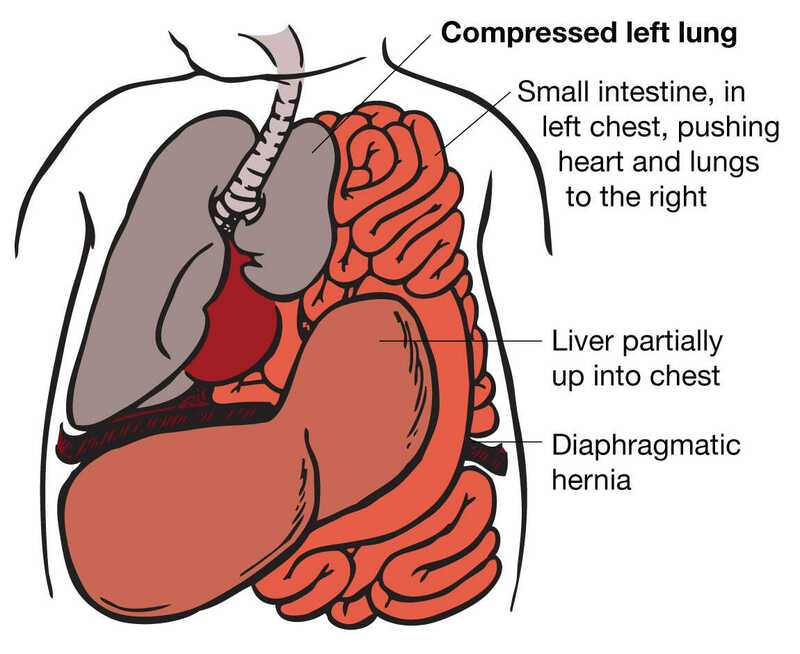 We have defined this group as: 1) a part of the liver has moved into the fetal chest cavity, and 2) the measured lung on the right side (not the side of the hernia) is small and has a lung to head ratio (LHR) of less than or equal to 1.0. In order to be considered for fetal intervention, you must first undergo an amniocentesis to determine that there are no chromosome problems with the fetus. The results of this test usually takes 7-10 working days. If you meet all these criteria and wish to be considered for tracheal occlusion you will need to travel to San Francisco for a formal evaluation. A formal evaluation between 22 and 26 weeks gestation would include: an ultrasound (to determine liver position and LHR), and ECHO (ultrasound of the heart to rule out any abnormalities), and counseling by a number of the members of our Fetal Treatment Center team (surgeon, social worker, perinatologist, nurse, etc). If you are found to be a tracheal occlusion candidate, and you chose to undergo the procedure, the tracheal occlusion operation will be performed between the 26th and 28th week of your pregnancy. The procedure requires an overnight hospital stay. After discharge from the hospital you will need to stay in San Francisco while the balloon is in your fetuses' trachea. This is usually for a period of 4-6 weeks. During this time you would have weekly ultrasound and medical appointments. After 4-6 weeks, you would again enter the hospital for an overnight stay to have the balloon removed from the fetal trachea. If the procedures are successful, you could return home to continue your pregnancy and to deliver your baby. Both the evaluation and the operations need to be authorized by your insurance company. Most insurance companies have paid for this procedure for their insured. You should contact your insurance company to determine whether pre-authorization is required. We can provide you with the diagnosis and procedures codes. For more information please contact our center. Babies with CDH should be delivered at a tertiary perinatal center with a high-level intensive care nursery and pediatric surgery. Although some babies will have a very favorable outlook (LHR > 1.4) they will still need high level intensive care, and should be cared for by neonatologists and surgeons in an ICN experienced in high frequency and oscillation ventilation, nitric oxide inhalation, and particularly extracorporeal membrane oxygenation (ECMO). It is not possible to tell before birth how much support any baby will need after birth. Babies with CDH known before birth should not be delivered in an institution incapable of providing all the support needed as transporting a sick baby can be dangerous. Babies with CDH should be delivered into a “set-up” where the neonatologists take the baby from the obstetricians and immediately provide life support—breathing, oxygen, IV fluids, etc., as needed. The baby’s response will determine the amount of breathing support is needed, ranging from a little oxygen to a breathing machine to ECMO. The severity of the lung problem will also determine the course in the intensive care nursery—again, ranging from surgical repair in the first day and home in a few weeks, to full support including ECMO, surgical repair (sometimes done while the baby is on ECMO), and then months of very intensive support before going home. The long-term outcome depends on the severity of the CDH and the need for very intensive support. How a baby with congenital diaphragmatic hernia recovers after birth is determined by many factors. Babies who experienced more severe CDH may face challenges which can include mild learning problems, breathing illnesses, hearing loss, and growth problems. Respiratory issues — Infants with CDH often have respiratory problems due to impairment in lung growth (lung hypoplasia) which occurs before birth. Some children may require supplemental oxygen at home. Some children fatigue easily with exercise or have respiratory problems such as asthma that improve with breathing medications. Respiratory Syncytial Virus (RSV) — RSV is a common cold virus that infects many people each winter. Children with CDH do not have normal lung development and are more susceptible to RSV infections. Pulmonary Hypertension — Newborns with CDH can have pulmonary hypertension (constricted blood flow to the lungs) that persists beyond for a few weeks to, rarely, many months after birth. Nutrition & oral aversion — Some children with CDH tire easily since they are working hard to breathe, so it is difficult to take in everything they need by mouth. Gastroesophageal reflux disease (GERD) — Children with CDH frequently suffer from gastroesophageal reflux disease (GERD) where their stomach contents reflux or back-up from the stomach into the esophagus. Since GERD is so common in CDH patients, most CDH patients take antireflux medications for some time. In severe cases, a fundoplication surgery may be recommended. Abdominal pain & appendicitis — Children with CDH have an atypical intestinal position because the intestine that was in the chest was moved manually into the abdomen. This is important to know in the event your child develops abdominal pain and appendicitis is suspected. The appendix may be in a different position and the medical team should be made aware of this. Constipation — For reasons that are not known, children with CDH frequently suffer from constipation. This is relieved with regular pediatric laxatives. Bowel obstruction — The operation to move your child's organs from the chest into the abdomen can sometimes cause adhesions, or scar tissue within the abdomen that can kink the bowel. This kink will block the flow of liquid in the intestines. This is called a bowel obstruction. Scoliosis — Children with CDH can develop scoliosis or a curve in the spine as they grow. This may be related to differences in lung size on the two sides of the chest in children with CDH. Pectus chest wall deformity — Some children with CDH may develop a depression of the sternum, or breastbone. This is called a pectus excavatum. Hearing screening — Children who have been intubated on a ventilator with supplemental oxygen, received multiple medications, or have been treated with ECMO are at risk for hearing loss. Regular hearing screening is advised. Developmental delay — Children who have been ill and hospitalized for prolonged periods are at risk for delay in normal development. It is important to identify any developmental delay as early as possible. The LIFE clinic is a multidisciplinary program which is part of UCSF Pediatric Surgery that involves a team of specialists, which includes gastroenterologists, neonatologists, pulmonologists, dietitians, and the pediatrics development team, led by the pediatric surgery service. Patients seen at the LIFE clinic Children range from infants to teenagers with CDH and other birth defects. Anticipation and management of health problems associated with CDH and other birth defects is the main focus of the LIFE clinic. By controlling or preventing these problems our patients are able to live more comfortably, stay healthier and enjoy a better quality of life. We believe that minimizing chronic illnesses and associated disabilities helps our LIFE patients maximize their capabilities. The UCSF Fetal Treatment Center has been on the forefront of fetal treatment research since it's inception. The first open fetal surgery in the world was performed at UCSF over 3 decades ago and we continue to dedicate ourselves to research and innovation. Cherubs — The association of CDH research, advocacy, and support. Information, forums, member blogs, and more.